One of the most important functions of project controls and cost engineering, is the ability to accurately forecast remaining costs-to-complete on a construction project. With the new Resource Forecasting tools in 4castplus, project controls professionals can now achieve ultimate accuracy and take full control of how projects are forecasted. 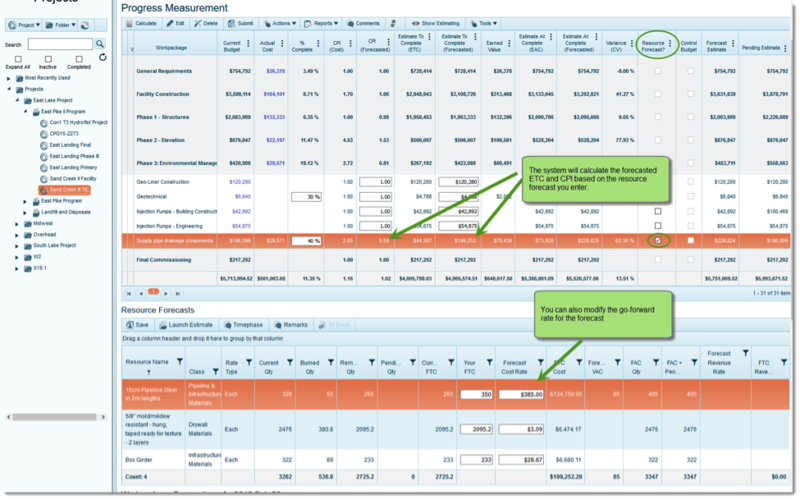 4castplus Resource Forecasting provides powerful and easy-to-use tools to capture anticipated quantities and costs of labor, materials, equipment, etc. that will be required to finish the project. What this means is, you can now go much further than simply entering a lump sum Estimate-to-complete value, or a forecasted CPI productivity ratio, to forecast remaining spend. 4castplus takes it to the next level by enabling visibility into what was budgeted, what was burned and what’s remaining according to budget. And then provides a simple interface to predict remaining amounts. Moreover, it delivers this visibility down to the take-off resources that were originally budgeted on the project. To give you a better sense as to what this means and why it’s important, here are 7 key things about resource forecasting that you should know. To simplify your forecasting effort, 4castplus gives you an easy interface to enter the quantities of labor, equipment or materials remaining to complete any task. So, let’s say for example that one of the take-off line items on the original budget for a project activity was 320 units of 2m lengths of pipe. Then, after a couple months, 55 of those units were delivered and installed. This leaves 265 remaining according to the budget. However, let’s say now that your subcontractor is telling you you’re going to need more than that 265, you’ll actually need another 350 to complete the activity. To see how this plays out in a resource forecast, have a look at figure 1 on the right. Once you’ve saved that forecast update, the system will automatically calculate your Estimate to Complete forecast for the activity. In addition to that, you can also override the go-forward cost and/or revenue rate for the forecasted amounts. In the above case, you’ve actually specified an additional 85 units over the budgeted amount. The 85 is shown in the “Forecast VAC” column, which stands for “Variance at Complete”. This means that the variance from budget is 85. You may have reason to believe that those 85 may cost more (or less) than the 320 that were budgeted. The system automatically populates this field with the budgeted cost (and revenue rate if applicable) – which you can then update to the new forecasted rate.See Figure 2 on the right. Once you’ve specified the remaining quantities and costs in the forecast, you can then go on to identify when exactly those additional units will be burned. After clicking on the Timephase button in the resource forecast area, a window will popup to enable you to indicate which period each of the forecasted quantities will be utilized. The system will provide pre-configured algorithms for Front-Load, Rear-Load and Bell-Curve time-phasing – or you can enter the quantities per period manually as preferred. In Figures 1, 2 above, if you were to click on the “Launch Estimate” button, a window would popup showing that an additional 85 units (each) of that pipe material has been added to an estimate. The system is managing an estimate in the background that is specifically dedicated to your ongoing forecasts. The “Forecast” is connected directly to a progressing period. And as you may be aware, Progress Measurements in 4castplus are created and submitted in iterative periods. The system will carry-forward all the forecasting information from one period to the next. This brings a tremendous amount of extra power for visualizing how the forecast and progress data are trending over time. As part of the Progress Measurement, 4castplus will automatically calculate Earned Value (EVM) metrics based on productivity ratios to date. 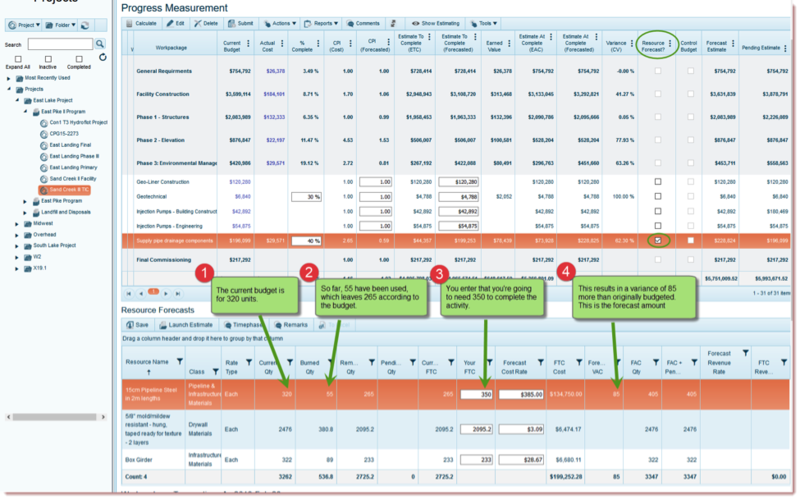 This works by comparing planned, actual and progress; and applies formulas to calculate key metrics like cost variance, estimate-to-complete, etc. EVM forecasting essentially uses past performance to predict future outcomes. While this is tremendously valuable, it can potentially lead to misleading projections if there are anomalies in past productivity; or if the project team takes corrective action on poor performing areas of the project that lead to improved performance in the future. The Forecast therefore, gives an alternative view of remaining cost-to-complete and future predicted productivity ratios. 4castlpus delivers both EVM and Forecast views for comparative purposes and sober oversight. As mentioned above in #3, the system is in fact managing an estimate – which is referred to as the “Forecast Budget” – in the background. This Forecast Budget is structured internally as a special type of Change Order. Since the resource forecasts that are entered may ultimately need to be worked into the project budget as an approved change, 4castplus makes it very easy to transfer the forecasted items into an open Change Order. From the above example, those extra 85 units of pipe can be submitted as part of a change order to get them in the project’s current budget. 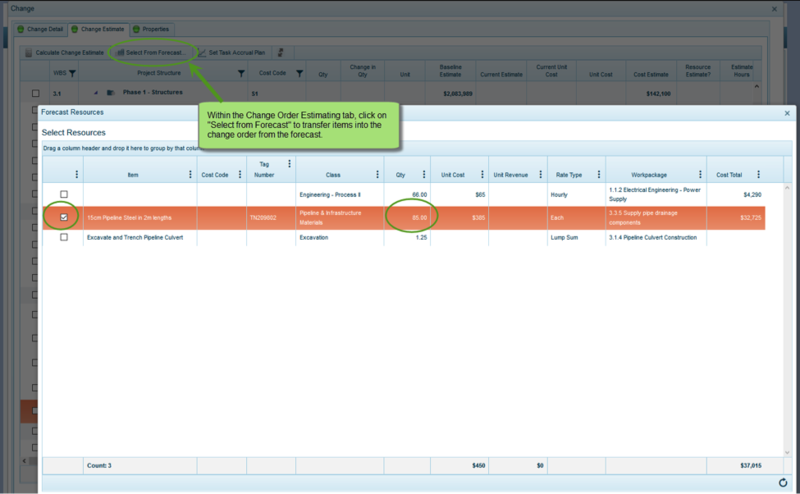 If you look at the figure to the right, you’ll see that from within an open change order’s Estimating tab, you can select the “Select from forecast” button to choose items to move from the forecast into that change order. There are a Project, Resource and Corporate Reporting the Forecast Budget. You can, for example, view the Forecast budget as a timeline curve, and compare it side-by-side with the Current in-progress budget. Many key pre-built, ad-hoc, dashboard and templated reports also include the Forecast budget alongside other important metrics. Free 4castplus Demo: Sign Up Today! Want to see how 4castplus can simplify your forecasting efforts? Sign-up for our FREE demo, here.